The convenient quick mount style of this system makes it easy to install either on the right or left side of the burner. It is fully equipped with a 90 degree hood pilot burner assembly, a low profile insulated heat shield, and the fittings that are required in order for you to use it with approved HPC burner pans. 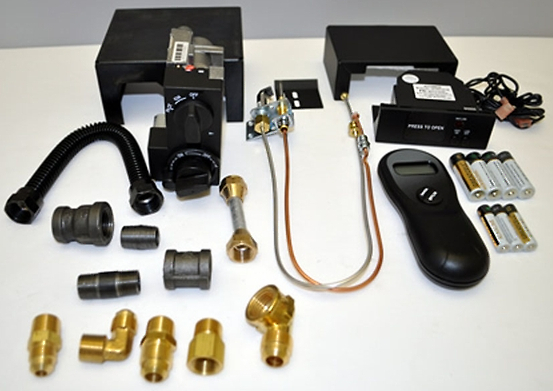 Designed for use with natural gas systems, this product also comes with an Acumen RCK-M remote that allows you to control your flame with the touch of a button. Can this gas valve be activated manually when the remote fails to open it ? Yes, if the remote is not working the valve can be opened manually. Can you describe the functions please? The remote will turn the unit on and off and adjust the flame height. Is 110 volt required or is it all batteries? It is operated by batteries.